Crew Take Care of Orioles ~ The Bucky Channel - The World of Sports from Wisconsin's Perspective. In the last month, the Brewers have compiled a record of 20-10. They've picked up a few games on the Cubs, and are the near leaders in the Wild Card race. Even though they've been plenty of games, and series for that matter, in which they fall behind early, the Brewers have been able to roll to a 20-10 record via the comback. Today was no exception. It wasn't the best outing for Manny Parra today, struggling a bit early and giving up two runs in the first inning. He would eventually make it through the 5th, giving up three runs on the day. But if there are two things the Brewers are good at, it's comebacks and home runs. A Corey Hart 2 run shot in the 2nd. A Bill Hall homer in the 5th. Those two swings of the bat were enough to give the Brewers the 3-3 tie, and from there they never trailed again. DeFelice, Riske, Mota, and Torres were able to keep the Orioles at bay for the rest of the game, while Torres picked up his 12th save of the year in the process. With the help of their bullpen, the Brewers went on to win this one 7-3, thanks to a J.J. Hardy RBI single in the 5th, and two home runs from Prince Fielder in the later innings. 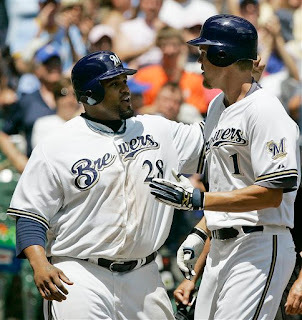 At 21-10 in their last 31, the Brewers are putting together a run similiar to how they started the 2007 season. Here's to hoping they can keep that momentum going until the All-Star break, and then avoid the annual Ned Yost 2nd Half Collapse. The Brewers now travel to Atlanta for a three game set, as it's their turn to play in the non-interleague series during the interleague play season.